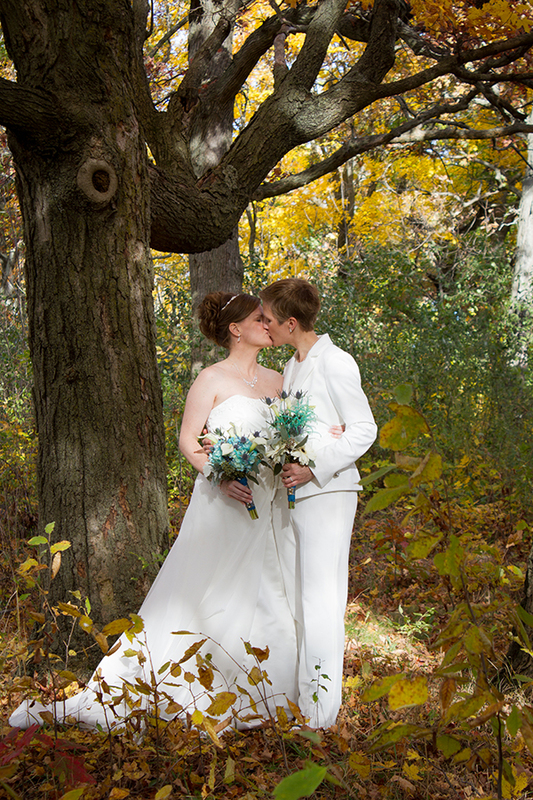 Alyssa and Michelle were married at High Cliff State Park in Sherwood on October 20, 2017. The weather was perfect and the fall leaves were stunning. I have never been to High Cliff State Park before this date and I told the brides that if I lived closer, this would be my new favorite shooting spot. It was absolutely beautiful. I absolutely loved shooting in that park. 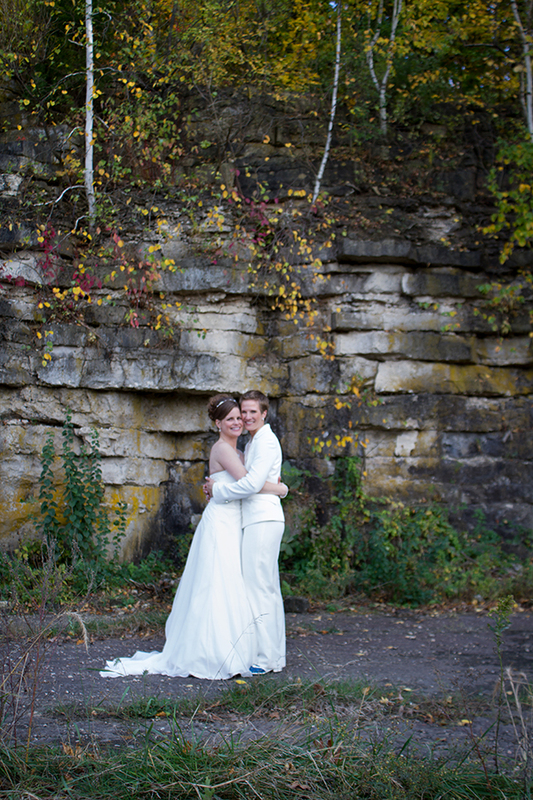 My favorite part of Alyssa and Michelle’s wedding day was their no look – first look. They each took a side of the pillar and held hands but never caught a glimpse of each other. I could tell in that moment exactly how excited they were for this day. A close runner up to that is the sparkler celebration at the end of the night. 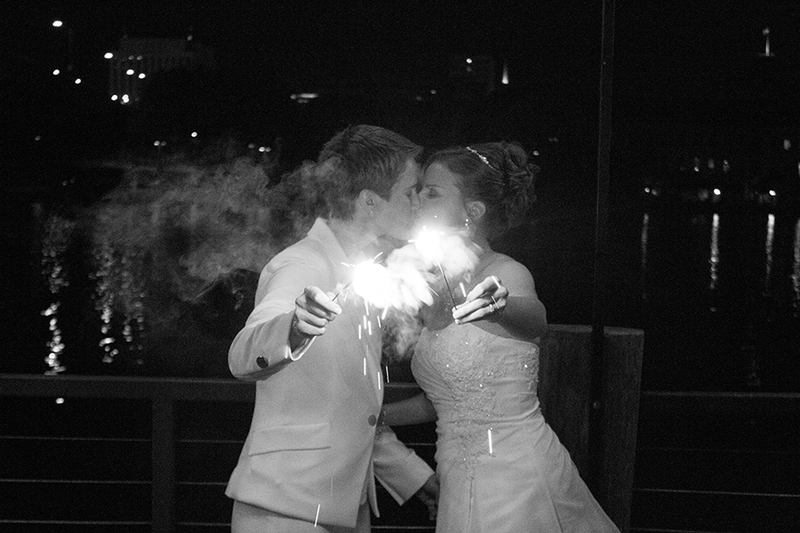 The sparklers had special meaning to the brides and having their guests partake in the tradition they had was truly special. Congratulations Alyssa and Mchelle. Enjoy your photos! Beautiful pictures for beautiful brides. Gorgeous! You really captured these two. Nice work! Beautiful pictures. Kelly, you captured all the love in these pictures. Absolutely breathtaking. Absolutely beautiful! 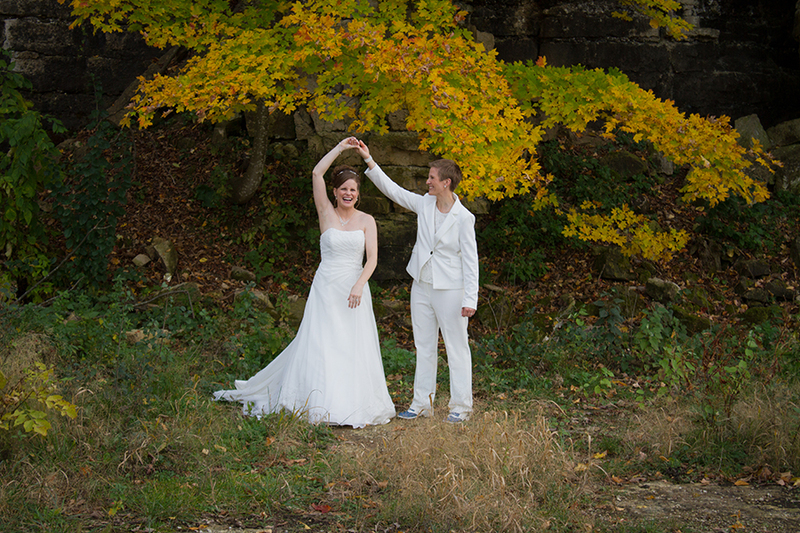 Fall colors and happy brides! I love all of these. My favorite is the sparklers! Wait, it’s thr the one with the trolly. Or maybe the one under the trees. Ah, all so amazing. Beautiful! I love all of these! But I especially love the subjects! Absolutely beautiful pictures! Beautiful day and most of all beautiful brides! These photos are so loving and lovely. Kelly, you showed the happiness that was throughout the day. My favorites are the hands and the sparklers. And the first one. Two beautiful people starting their lives together, I love them. Awesome photos! Love the black & whites! Beautiful day for a wedding and very cool photos! So beautiful. Sad to have missed it. Love you! These are wonderful! You two look beautiful! 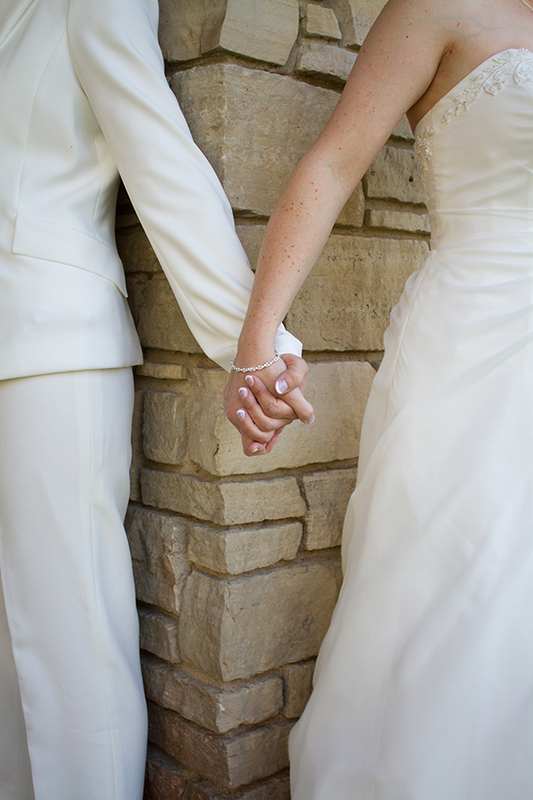 What great photos to remember this special day… But truly, how could you go wrong with such beautiful and happy brides?! Beautiful pictures for beautiful ladies! Very happy to be a part of this special day! The day was absolutely perfect. 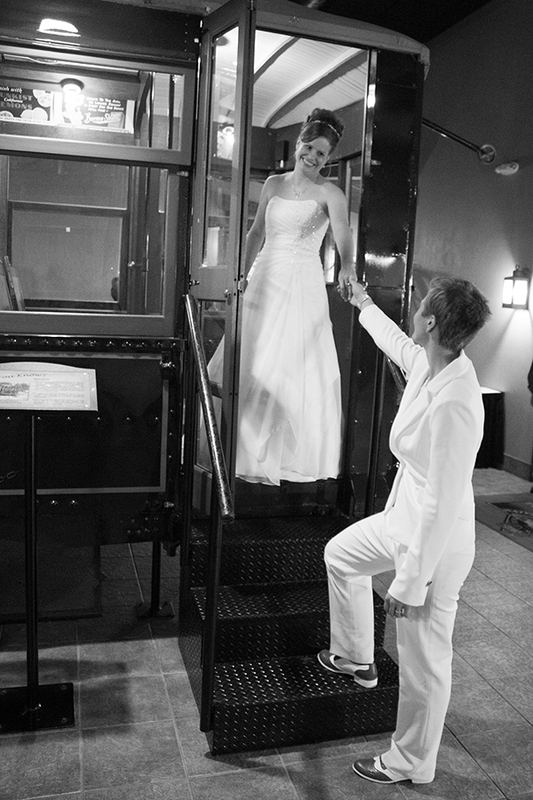 These pictures definitely capture the love these two gorgeous brides have for each other. Gorgeous photos with a perfect setting for a beautiful couple! Awesome photos. Definitely captured the mood that day. I loved all of the photos. 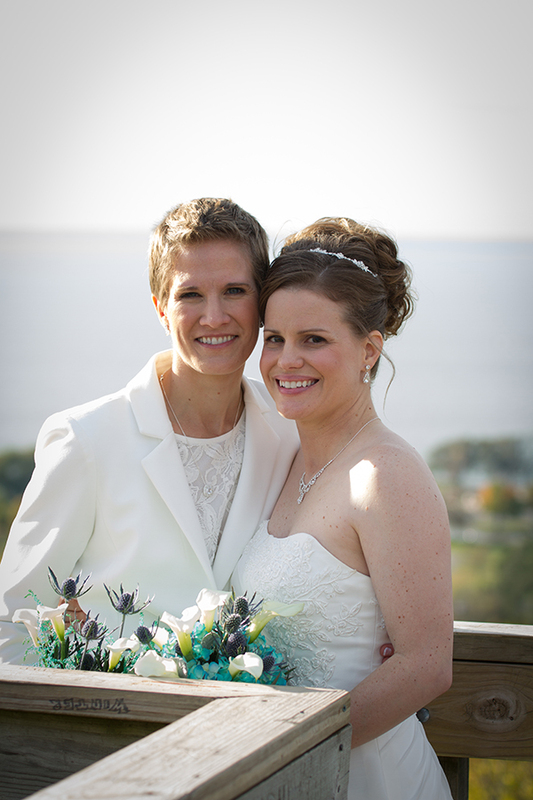 Beautiful day…wedding…and brides. Your photos are amazing!! Absolutely stunning – beautiful work! Beautiful pictures of beautiful ladies!! Amazing! You really captured the day.